Eduardo Gordillo has found a way to cut down the mountains of plastic waste. 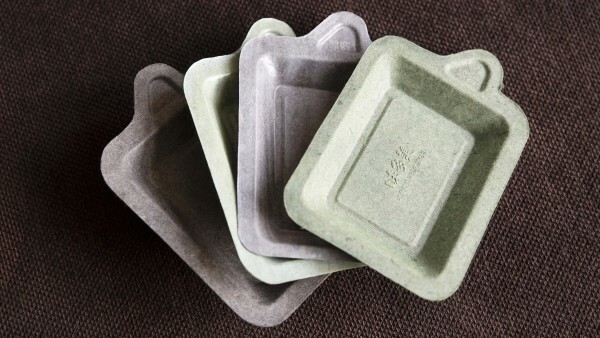 His firm Bio-Lutions is manufacturing packaging material and disposable tableware made from crop waste. It's cost-effective, 100% compostable and provides benefits for smallholders. Eduardo Gordillo lives in an energy-plus house of his own design in Lower Saxony. 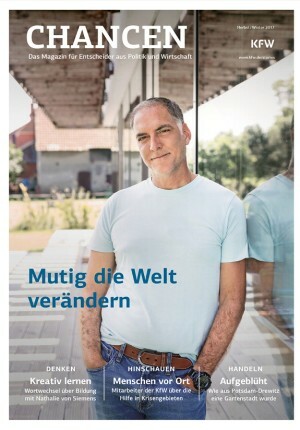 Now 51, he met his German wife in his home country of Colombia and moved to Germany to be with her, despite a successful career as an architect. Speaking virtually no German, he began a degree course in industrial design in Stuttgart. Five years after graduating, he founded Upgrading in Hamburg, which makes displays for cosmetics, jewellery and similar products. While continuing to work with Upgrading, over the last five years he and his company Bio-Lutions have developed a material produced from crop waste that can be used for packaging and disposable tableware. Mr Gordillo, 2017 is a crucial year for your firm Bio-Lutions. For five years, you have been developing and testing a new packaging material made from crop waste. Now it’s going into production. Yes, that’s right. 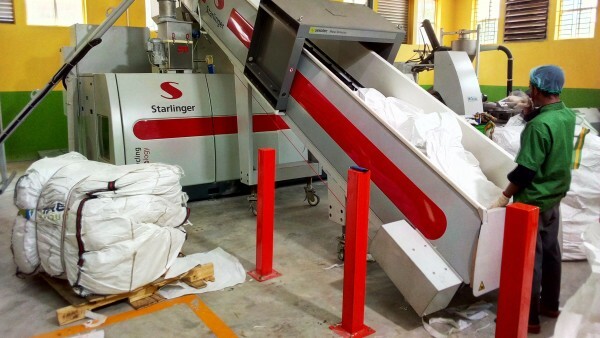 At the moment, we’re only manufacturing 600 kg a month in our Indian pilot plant. Once we finish extending the factory in April 2018, however, we’ll be making six tonnes a day. Our customers include Bigbasket, India’s biggest online supermarket, as well as Licious, India’s biggest online butcher, and Coffee Day, the Indian equivalent of Starbucks. We also have distributors who sell large quantities of our disposable tableware. We have so much interest from potential customers that we’re already planning to build a second production line in 2019. Why is there such huge demand in India? The Indians need solutions right away. Their refuse collection system doesn't work, and in the streets there’s just rubbish, rubbish, rubbish everywhere you look. Most of it is plastic. In India, cows are sacred and are allowed to roam freely. They eat this plastic and then they die. Here in Germany, our waste is less visible. Obviously, Germany needs to cut down on plastic packaging, too. But in other countries, the cry is more urgent: Here! Now! Immediately! Is that why you’re manufacturing in India? Demand exists worldwide, obviously. For a firm in its infancy like Bio-Lutions, however, it’s less risky to start in a country like India where the costs are lower. You can try more things out over there, and you can afford to make a few mistakes. There’s also another reason why Bangalore is the perfect place for us to locate. The surrounding region has 300,000 hectares of farmland, so there’s plenty of crop waste – our raw material. The social aspect was important to us, too. Lots of Indian farmers don’t earn enough to feed their families, and selling crop residues that would otherwise go unused to Bio-Lutions is something that we expect to improve their lives. We are also getting help from the “Make in India” programme, which is a government scheme aimed at making India more attractive as an industrial location. Then there was the business with the plastics ban. Some Indian states have banned disposable plastic completely. One of them is Karnataka, which is where Bio-Lutions is now manufacturing. There are already alternatives to non-reusable plastic, such as cardboard or biodegradable plastics. What makes Bio-Lutions different? We use only water and dried plant remains, with no other additives except heat for drying. Natural cycle - The idea behind the biodegradable packaging is a natural cycle: The agricultural waste is turned into fibres, which in turn can be processed into packaging. After use, the packaging can be composted as organic waste or incinerated with virtually no CO₂ impact. Step 2 - Short routes of transport are another major advantage. Step 3 - The process of grinding the raw material has been patented by the founder. 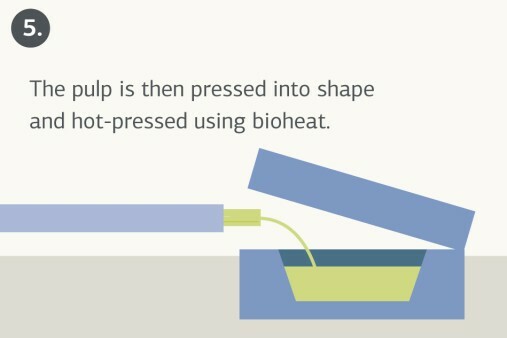 Step 4 - Combined with water, it forms a sticky substance. Step 5 - Different forms are moulded by using heat. Step 6 - After use, the packaging can be disposed of in an environmentally friendly manner. The idea behind the biodegradable packaging is a natural cycle: The agricultural waste is turned into fibres, which in turn can be processed into packaging. After use, the packaging can be composted as organic waste or incinerated with virtually no CO₂ impact. In mid-October 2018, KfW Group launched the Clean Oceans Initiative together with the European Investment Bank (EIB) and the French Agence Française de Developpement (AFD). The partners have committed an initial amount of EUR 2 billion for reducing plastic pollution of the oceans. 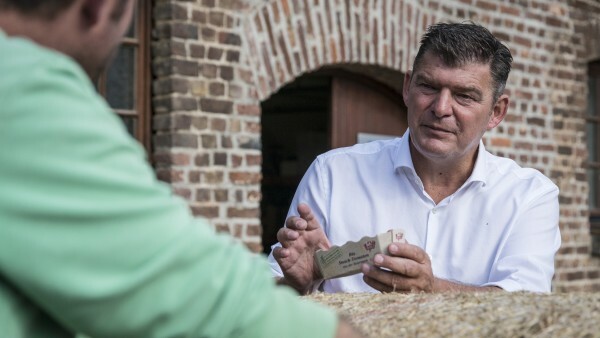 Together with Richard Hurding at Zelfo Technology, I developed a patented upcycling process that transforms crop waste into ultra-fine fibres. 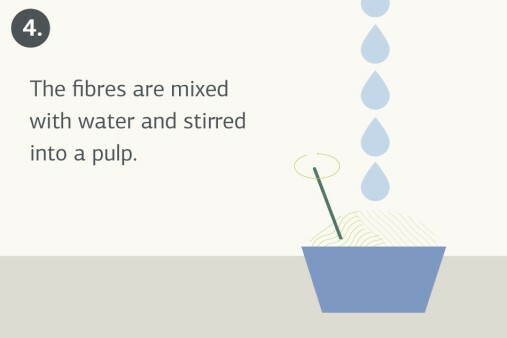 The surface of the fibres is roughened so that they bind together when you add water. You can press the wet pulp into any shape you like and dry it out. You’re an architect and industrial designer by trade. What led you to develop this material? Since my daughter was born, if not before, I’ve been worried that we are destroying our planet. She’s now seven. About five years ago, the moment came when I said to myself, I’d like to do something with my life that leaves a mark, and I want it to be in ecology. So why an alternative to throwaway plastic? Why not save the whale, or the rainforest? Sure, there are thousands of other ways you can get involved. But I’m not a vet or a biologist. I’m an industrial designer, so packaging was an obvious choice for me. It was the documentary Plastic Planet that jolted me into action. I wanted to develop a material with which we could change the world of packaging. They may not look like it, but Bio-Lutions products are made from nothing but plant waste plus water. That’s quite a goal! In nearly five years of development, there must have been a few setbacks. There were lots of them. The hardest time was in December 2014, when the mechanical process for making the fibres still wouldn’t work. At the time, I said, “We’ll try it a couple more times, but if it doesn’t work, we’ll have to change tack – we’ll have to try something else. Surely you wouldn’t have just given up? I didn’t want any partial solutions. People are always making do with partial solutions. I wanted to find THE solution. Certainly, it was very frustrating at the end of 2014, but after that we made two more attempts, and then we got it right! Our procedure can be used anywhere in the world. It doesn't matter whether the raw material comes from rice straw, banana stalks or tomato plants. Our packaging is 100% compostable, it is CO2 neutral when incinerated and if we get it back it can even be recycled. You can’t beat that. That’s nature. In nature, there is no waste. Any product can be reused, if it is designed that way from the start. It’s a cycle. That’s how nature works. The KfW subsidiary DEG – Deutsche Investitions- und Entwicklungsgesellschaft – provides funding for innovative business models via its Up-Scaling programme. The programme is targeted at early-stage SMEs in developing and emerging-market countries which want to scale up projects that are already yielding positive developmental returns. DEG provides interest-free loans of up to €500,000, with repayment contingent on success. In the case of Bio-Lutions GmbH, DEG provided part of the funding for the production facilities in Bangalore. We’re still a long way from that point. Take oil, for instance. It takes three million years to form. 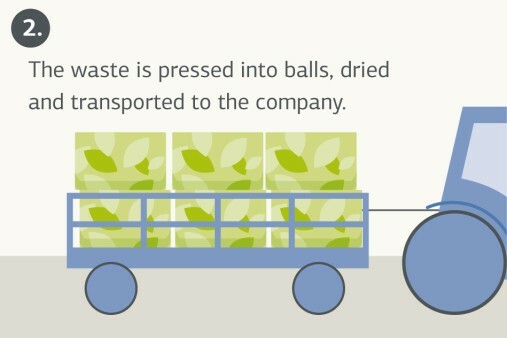 We make products from it that we use up in a single minute. Three million years for one minute! We won’t stop needing packaging for transportation. But we ought to use materials for it that regenerate quickly, like plants. We’ll still only use the products for a minute, but the environmental equation is much better. It’s better value for money, too. One thing that was always clear to us was that we would never succeed with our packaging if it wasn’t affordable. Ecology follows economy. Packaging and process engineers are the experts in this field. 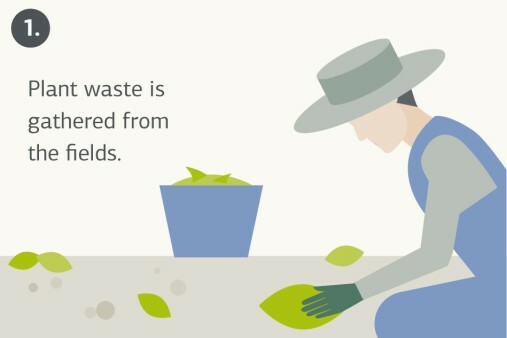 What convinced you that you were the one who could create packaging from crop waste? I believe that if you spend all day in your own specialist field in which you have a lot of know-how, you’re actually limiting yourself. When someone like me comes along who doesn’t know as much, he can take a naive approach to the issue, ask seemingly stupid questions and come to a completely different end result. Is that an approach that has worked for you in life? Yes, always. My motto is: be ignorant, because then you can ignore the obvious. If your boundaries are too narrow, you won’t have any room to move. What’s the source of this bold self-confidence? I was born this way. Ask my mother! I always took a lot of risks, right from an early age. Too many sometimes. No doubt those were good learning experiences for a child. But how do you deal with risk as a businessman? We financed everything through my company, Upgrading. My partners, Stefan Dircks and Peter Mayr, and I made the funding available, and I discussed every single step with them. It was also Stefan Dircks who put us in touch with DEG, and now DEG is co-funding our pilot plant in Bangalore. This article was published in CHANCEN autumn/winter 2017 "Courage". What does working with DEG mean to you? DEG is a real partner. They give us very professional advice, and they’re also very easy to work with on a personal level. When people break new ground as often as you do, there are bound to be setbacks. What stops you becoming disheartened? Of course there are difficult periods. But somehow it’s in our nature to get back up off the floor and carry on. Your goals don’t just disappear. So what does it take to make you lose heart? Plastic waste is a threat to our oceans' ecosystems as animals mistake waste for food and die in cruel circumstances. Dr Ralph Kadel, member of the Management Board of Blue Action Fund, sets out possible solutions. Paper manufacturing consumes a lot of energy, wood and water. 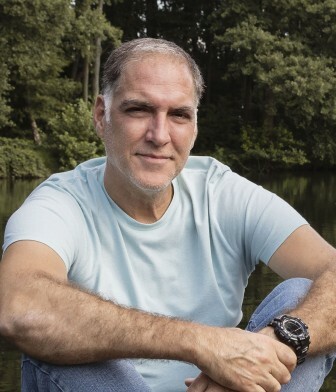 Entrepreneur Uwe D’Agnone went in search of a more sustainable alternative. The grass paper he developed also convinced the jury of the KfW Entrepreneurs' Award 2017. The Creapaper company was awarded the title of National Winner. 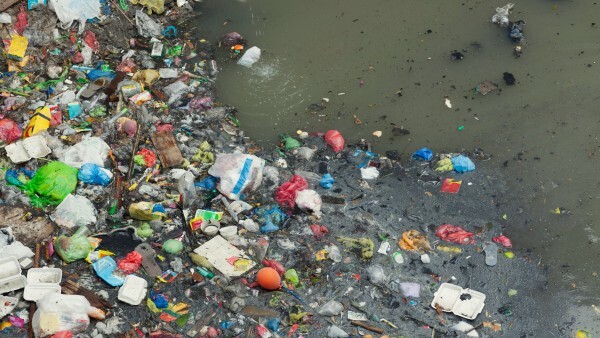 Huge quantities of plastic flow through the Ganges Delta out into the sea, which is why recycling is so important here. With support from DEG, a Dutch packaging company has teamed up with a local partner to launch a plastics recycling start-up in Bangladesh.